A classic example of Bangladeshi home cooking, this shutki shira recipe combines umami-rich dried shrimp with the fiery fruity heat of the revered naga chilli. 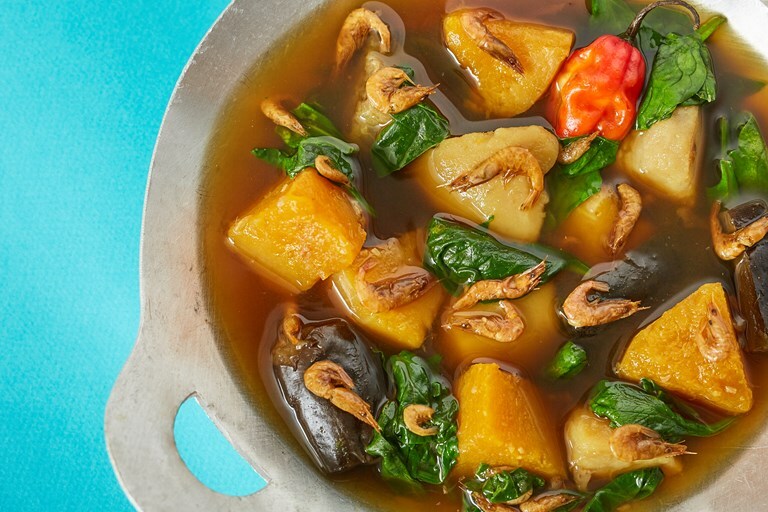 With potato, aubergine, pumpkin and spinach cooked in the broth, it is a hearty and healthy dish cooked without any fat whatsoever that's traditionally enjoyed during the summer. See the rest of Dina's Bangladeshi recipes here. Shutki is a much-loved Bangladeshi delicacy of dried or fermented fish and prawns, and somewhat of an acquired taste. It’s cooked in a myriad of ways, however in the Sylhet region it’s incorporated into this stunning dish called shutki shira (shira meaning sauce). The umami taste of dried shrimp combined with the intoxicating fragrance of the fiery naga chilli and fresh vegetables in a light broth is both comforting and satisfying. Cooked without a drop of oil or fat it’s a healthy and wholesome dish made with a combination of seasonal vegetables, which usually includes potatoes and aubergine. 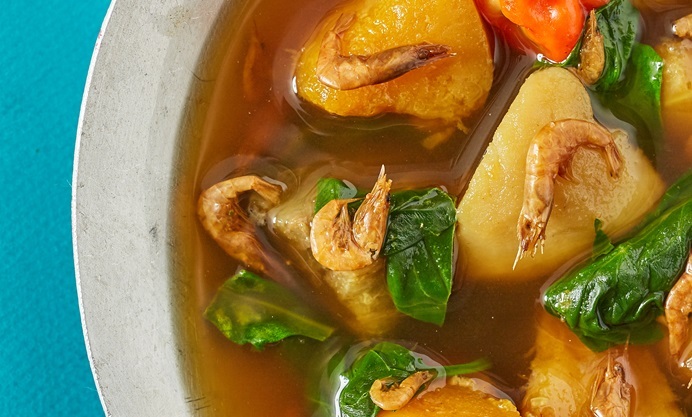 For this dish I’ve chosen dried shrimp (which is readily available in Asian supermarkets) and paired it with pumpkin, potatoes, aubergine and spinach. The naga is used for its unique fragrance as well as heat so it’s worth seeking one out from Bangladeshi grocery shops. If you cannot find fresh naga, substitute it with a scotch bonnet chilli and leave it in for the duration of the final 10 minutes. Serve it with steamed white rice and you have yourself a classic taste of regional Bangladeshi home cooking.